DC highlighted the importance of vendors in our daily life. He stressed that no house can run without the vendors and therefore it is necessary to recognise their services and to have proper designated vending zones in the Capital Complex. He lauded the effort of the EAC Naharlagun, IMC, All Arunachal Pradesh Hawkers and Street Vendors Federation (AAPHSVF) etc for the successful establishment of the vending zone as it requires a group effort and hoped that they would continue to provide their support to the District Administration. Calling everyone a stakeholder, the DC urged them to work in coordination with each other and to acknowledge the effort that was put by everyone. 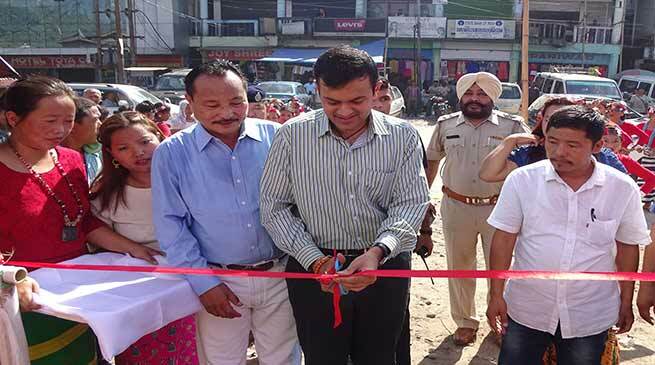 He also directed the AAPHSVF to ensure that such vendors run their business only at the designated locations. The Dy. Chief Councillor asked the vendors to work in coordination. He appreciated the DC for recognising the services of the vendors and hoped that it would go a long way in boosting the moral of the vendors. He also distributed dustbins during the programme. The EAC Naharlagun highlighted the provisions of the Street Vendors Act 2014 and the Arunachal Pradesh Street Vendors Act 2014. He also traced back the history of Vendors from the British Era and echoed the views of the DC that a state cannot run without its vendors. Gora Tallang also lauded the effort of the DC and hoped that he would continue to provide his support in such endeavour. Earlier Habung Lampung CMEO while welcoming everyone urged the vendors to work in cooperation and to keep the area clean. He stressed that we should all work towards setting an example for others to follow. Roger Nabam Hina, General Secretary, AAPHSVF thanked the DC for providing with an area for the establishment of vending zone. He also stressed on the need for more such areas for vending zones. He also requested for a proper storage to which the DC assured to provide cold storage for all the four vending zones in the Capital Complex. He also requested for the construction of toilet to which the DC assured to look into the matter. He further hoped that under the guidance of DC, the capital Complex would prosper to more heights.